Poliomyelitis in ancient Greece (5th century BC)? From Centre for Cretan Archaeology (E.V. ), Department of Humanities (DISUM), University of Catania; National Etruscan Museum of Villa Giulia (V.N. ), Rome; Santa Lucia Clinic–Polydiagnostic Medical Centre (E.V., F.M.G. ), Siracusa, Italy; and Archaeology (F.M.G. )., College of Humanities, Arts and Social Sciences, Flinders University, Adelaide, Australia. 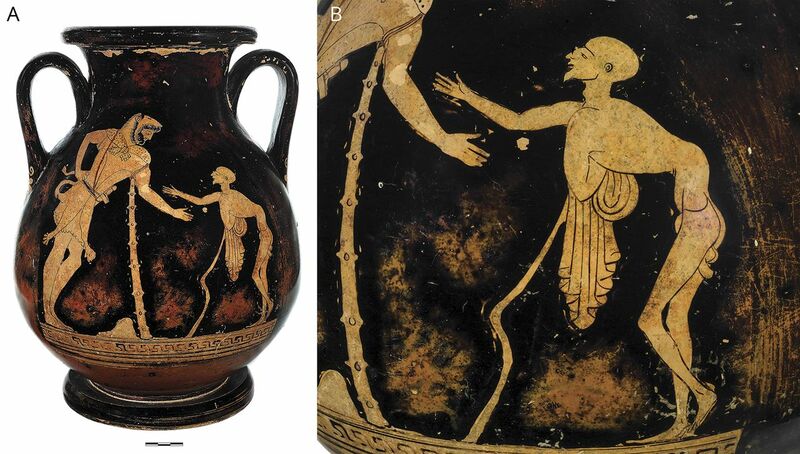 The antiquity of poliomyelitis is disputed, since only inconclusive evidence has been adduced for the Ancient World so far.1 A ca 480 bc Attic peliké vase imported into Etruria (ancient Central Italy) depicting the mythical rendezvous between Heracles and Geras (figure, A) shows the latter (figure, B), the personification of Old Age, helping himself with a stick. The high degree of realism of this artwork, emerging in this historical period, allows one to identify extensive lower limb muscular atrophy and an unnatural eye-catching kyphoscoliotic spinal deformity. While previously considered—prudently yet perhaps too hurriedly—but a depiction of senile emaciation and pulmonary emphysema,2 the characteristically vivid clinical association leads us to hypothesize that Geras' anatomical features are compatible with those of a polio survivor exhibiting the incapacitating and long-term outcomes of the spinal form of paralytic poliomyelitis. (A) Red figure Attic peliké from Tomb 432 of the Banditaccia Necropolis (Cerveteri, ancient Etruria, Lazio Region, Italy). Inv. No. : 48238 MiBAC. National Etruscan Museum of Villa Giulia (Rome). Photographs by Mauro Benedetti. (B) Detail of Geras shows the high degree of spinal deformity and muscular atrophy. E. Varotto: concept creation, data acquisition, main writing. V. Nizzo: critical revision of the manuscript. F.M. Galassi: study design, data processing, writing, study supervision.
. Poliomyelitis in ancient Egypt? Neurol Sci 2017;38:375.
. Le Malattie nell'Arte Antica. Firenze: Giunti Editore; 2000:136–139.